As we saw in the last web log entry in this series, digitising the signals gives some distinct benefits when it comes to adding a delay. Apart from being able to do it very precisely, you can change it quickly. However, digital data has another massive advantage. It can be easily copied. So, if you make a copy of your digital data, you can process each copy however you want. If you want to filter it differently (for example, to ‘listen’ at a different frequency) you can. However, you can also make a copy and apply different sets of delays to it. This means that if one copy of the data has one set of delays and another copy has a different set for the different antennas involved, then these two copies will be sensitive to different directions. In other words the telescope will be looking in two different directions at once! This technique of introducing delays and combining the signals to change the direction in which the telescope is sensitive is known as ‘beamforming’. And making digital copies and delaying them differently to sensitive in several directions is called ‘multiple beamforming’ (or sometimes ‘forming multiple beams’). 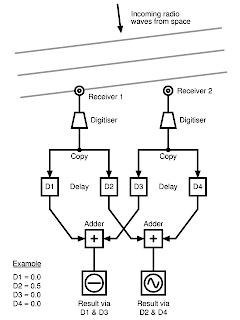 In the above diagram (which you can click to see a larger version), each received signal is digitised and split into two copies. 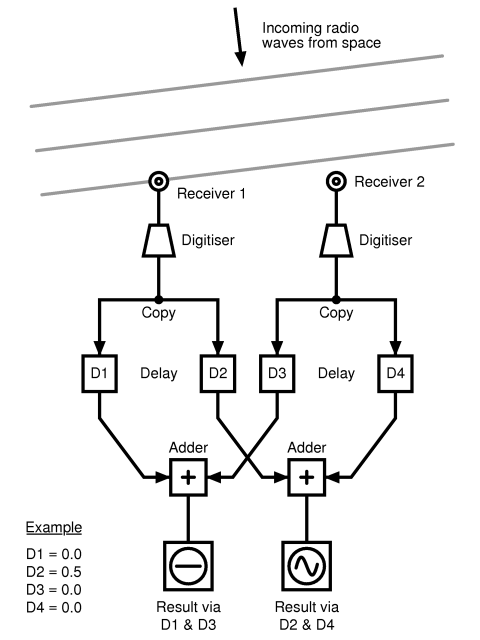 The copies are fed into the different digital delay units (D1, D2, D3 & D4). Let’s say that D1 and D3 have no delay at all. The added signal from these will be sensitive to something from directly overhead. In this case, the original radio signal was coming in obliquely; it adds out-of-phase and no output is seen. On the other hand, by adding a delay to D2 (but not D4), the added signal from these will be sensitive to the oblique radio wave. It adds in phase and a strong output is seen. Because the data is digital, you can copy and delay it as much as you want and there is no degradation of the signal. If you want to be sensitive in more directions, simply add more copies, delay units and adders. The limits are not related to the signal, but rather to issues of equipment, memory, power, space (... and ultimately the project budget). In practice, systems like KAIRA and LOFAR are also limited by the amount of digital signal processing equipment. At the time of writing this, LOFAR is routinely operating with up to 30 or so different beams. However, some experimental observations have been carried out with over 250 beams.